This report on the global hip replacement market is a business and commerce publication developed by professional and experienced research analysts as aspired to serve as a reliable decision-making tool for its targeted audiences such as medical device distributors, orthopedic implants manufacturing companies, health insurance players, healthcare institutions including hospitals, governing bodies, and regulatory authorities such as food and drug administration (FDA). The report provides insights on how the demand has evolved in the hip replacement market across the world and forecasts where it is headed during the period of 2017 to 2024. Starting-off with an executive summary on the current scenario, the analyst has included qualitative chapters on market dynamics wherein trends, drivers, and challenges have been analyzed. The market has been segmented on the basis of product type, component type, and end user, besides highlighting the potential of demand that can be expected out of various regions and countries. The report finishes off with a featured section on the competitive landscape of the hip replacement market, wherein numerous prominent players have been identified and profiled for their product portfolio and regional presence. Impact analysis of key regional growth drivers and restraints based on the weighted average model along with key region-specific trends is included to better equip clients with information and hidden insights. At the end of the report, Persistence Market Research has provided strategic recommendations for both existing and new players operating in the global hip replacement market to emerge sustainably profitable. The next section of the report highlights the growth trends of the global hip replacement market by region. It provides a market outlook for 2017–2024 and sets the forecast within the context of the global hip replacement market. The study discusses key regional trends contributing to the growth of the hip replacement market worldwide, as well as analyzes the extent to which drivers are influencing this market in each region. Key regions assessed in this report include North America, Latin America, Europe, Asia Pacific, and Middle East & Africa. 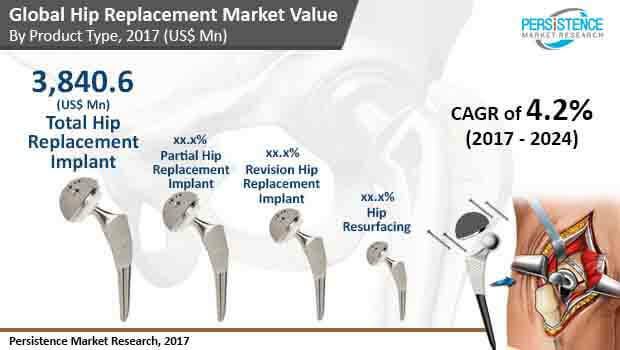 The above sections – by product type, by component, by end user, and by region – evaluate the present scenario and growth prospects of the global hip replacement market for the period 2017 –2024. To calculate the market size, the report considers hip replacement by product type, by component, by end user, and by region. The forecast assesses the total revenue of the global hip replacement market on the basis of various factors that are expected to affect the market in the short and long term. The data is triangulated on the basis of different verticals, considering both supply side and demand side drivers and other dynamics of the global hip replacement market, along with primary interviews of manufacturers and industry experts active across the global hip replacement market value chain. The report begins by sizing up the current market, which forms the basis for forecasting how the market is anticipated to take shape during the forecast period. Given the ever-fluctuating nature of the global economy, the report presents forecasts not only in terms of CAGR, but also analyzes the global hip replacement market on the basis of key parameters such as Year-on-Year (Y-o-Y) growth to understand market predictability and to identify the right opportunities in the global hip replacement market. In the world’s population, the percentage of geriatrics is rising. The United Nations has estimated that the number of people aged over 60 years would swell up to 2.1 billion by 2050, more than doubling from 962 million as of 2017. With this apparent increase in geriatric population, the healthcare industry is flourishing, particularly in the developed countries, and one the segment that is gaining strong traction is hip replacement. Geriatrics are highly prone to hip abnormalities and nearly a million hip surgeries are performed each year, as per the National Institute of Health (NIH). According to this business intelligence publication, the demand in the global hip replacement market will multiply at a notable CAGR of 4.2% during the forecast period of 2017 to 2024. Revenue-wise, the analyst of the report has estimated that opportunities in the hip replacement market, across the world, will translate into US$9,128.5 mn by the end of 2024, significantly more than the market’s evaluated worth of US$6,830.5 mn in 2017. Apart from escalating geriatric population, the hip replacement market is also feeding off the recent technological advancements, which not only have improved the quality of artificial hip but also made the surgeries more affordable for larger masses. The global hip replacement market also stands to gain from factors such as the prevalence of arthritis and obesity, government initiatives to provide care to ageing citizens, and favorable trade regulations. On the other hand, stringent FDA regulations for all metal hip implant products, substantial cost of surgeries, and lack of awareness in the rural areas of various emerging economies are a few restraints challenging the prosperity of the market for hip reconstruction devices. Product-wise, the hip replacement market has been segmented into total hip implant, partial hip implant, hip resurfacing, and revision hip implant. Among these, the total hip replacement segment is poised to provide for a demand share of 58.4% in the global hip replacement market by the end of 2024. Revenue-wise, the segment is anticipated to offer opportunities worth US$5,329.4 mn by the end of 2024. In total hip arthroplasty, the damaged bone and cartilage is removed and replaced with artificial prosthetic components such as hip stem system, acetabular cup system and others. The damaged femoral head is removed and replaced with a metal stem (cemented/non cemented) that is placed into the hollow center of the femur. The procedure is done partly (hemi-arthroplasty) or fully (bipolar - hemiarthroplasty). On the basis of component, the market for hip replacement has been bifurcated into ace tabular cup systems, hip stem systems, and revision accessories and components. As of 2017, the hip stem systems segment provided for the maximum chunk of revenue of about US$3,665.1 mn, and the demand for the same is also projected to multiply at most prominent growth rate in comparison to other segments. On the basis of end-users, the market has been classified into hospitals, ambulatory surgery centers (ASCs), and specialty orthopedic clinics. The hospitals segment is anticipated to continue gaining ground over others over the course of the forecast period. Region-wise, the analyst has underlined North America as highly profitable, gaining most of the traction from the developed country of the U.S. According to the United States Census Bureau, the median age of the country rose from 35.3 years in 2000 to 37.9 years in 2016. Additionally, obesity continues to be a major concern for the citizens, which invariably leads to the requirement of hip reconstruction. The North America hip replacement market is estimated to be worth US$4,202.3 mn by the end of 2024.